Earlier this month actresses Felicity Huffman and Lori Loughlin were arrested after being caught in a massive elite college admissions scandal where wealthy parents were paying for their children to be admitted in a wide ranging scheme that including cheating on SAT tests, falsifying athletic records and lying about race on admissions applications [click here if you missed that]. 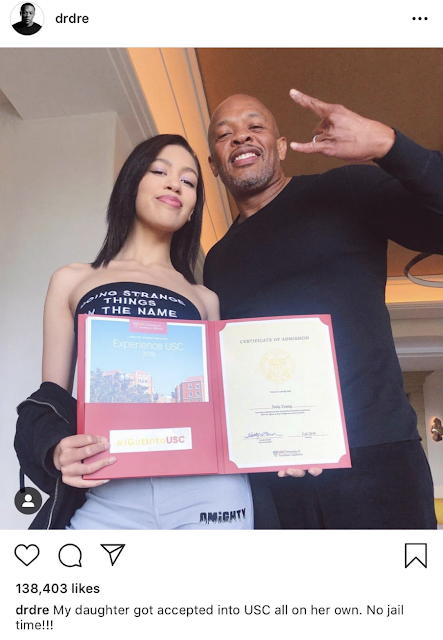 Over the weekend Dr. Dre posted a picture of his daughter on Instagram bragging about how she got admitted to the University of Southern California all on her own and how he didn't have to do any jail time. However, Dre's followers were quick to remind him about the small $70 million donation he made to USC just a few years ago and how an entire building on campus is named after him. 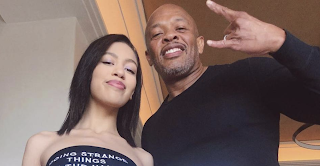 Dre later deleted the post. LMAO i see you Dre!!! I mean he is right!!! They said ther is a back door, side door (illegal), front door. Dre took the back door!!! hahahaha and he wont see jail time!! She gives me Aaliyah vibes!! Congrats to her and her proud father. Something to be proud of vs them growing up hip hop no school going "socialites"
Proud of what? The olde smoke and mirrors of rappers doesn't work anymore or works less. The "Dr" should of kept his mouth shut. He is still so ignorant after all these years. 11:15 exactly! people find reasons to put down everything black people do. BTW funding a building is not the same as cheating at all. That has been a standard of tax relief for decades.